With the Netbook market well defined with a range of low cost and low powered portable computers, Asus are at it again to carve out a new market of performance netbook machines. You’re probably thinking big deal, Sony have been experts in this area for years. Well, yes. Sony does make portable high-powered notebooks but you’ll have to take out another mortgage on the house to afford one with prices at £1800 or more. Times like these call on a new category of notebooks, Netbooks. Designed to be simple and cheap, they are increasingly popular for those who want the portability and durability. The hardware inside is capable of driving the basics of home computing such as web browsing and office productivity tasks. Netbooks are so cheap that you should be able to pick one up for as little as £200-300 or free with a mobile data package. 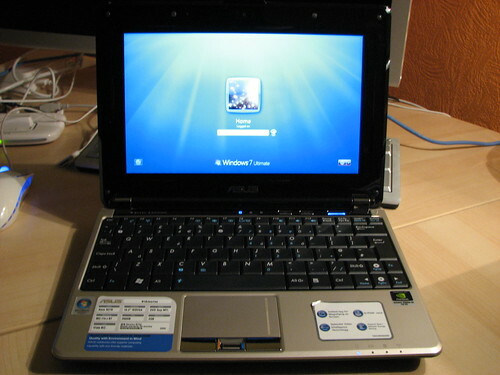 Asus have just kicked out the door a brand new model in their Netbook range. The N10J is around the £450 mark, keeping it within the affordable price band but edging towards what Asus has defined as the high-end Netbook market. With a 10.2-inch screen its overall footprint is very compact and makes it convenient for travelling with as I found out on my recent holiday. Rather than lugging my 15-inch MacBook Pro around with me, I had the N10J with me on my travels. The sturdy and quality build meant that it was able to handle the bumps and knocks of economy class flying as well as comfortably fitting on the aeroplane seat tray table. Great for watching films. 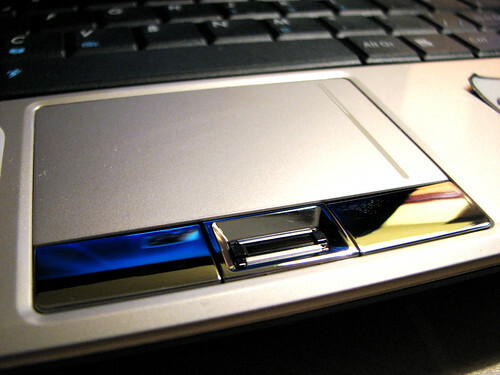 The LCD display has a very solid hinge design that is rigid and smooth to open and close giving a reassuring feeling. The keyboard is nearly full sized and is comfortable for short periods of typing, but as with any compact notebook you won’t want to write a novel on it. A generously sized 8cm touchpad with two decent sized left and right click buttons can be found directly below the keyboard. It allows for previse tracking and includes a window scroller that is activated through the software. 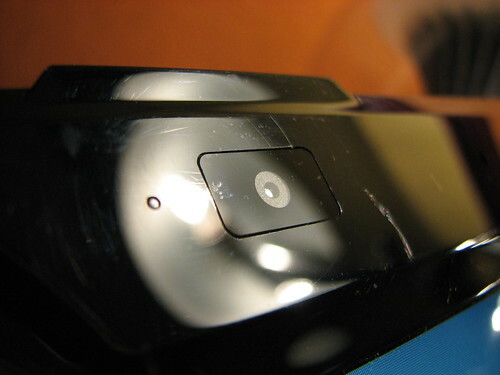 Slotted in between the mouse buttons is a fingerprint reader. The chassis has a glossy champagne-coloured finish with a black trim around the display. 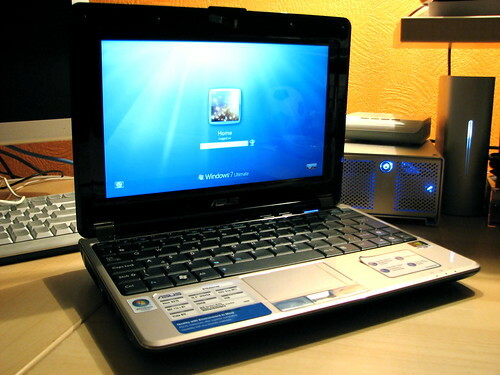 The 10.2-inch glossy display offers 1024×600 native resolution, fairly standard for a Netbook with that screen size. On the display bezel you’ll find a 1.3mp camera for capturing photos and video. Windows just wasn’t designed to run on small screens like this, so navigating this system whether you’re on Vista, XP or 7 can be difficult if you’re dealing with more than one window at a time. 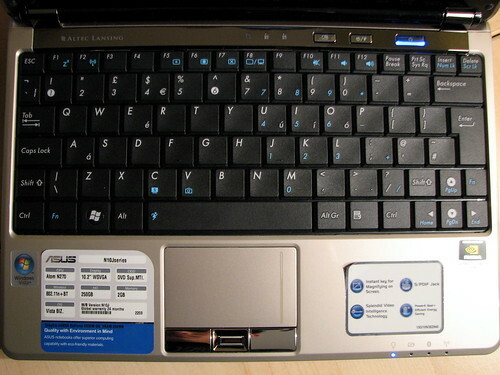 Perhaps this is where Linux excels on Netbooks which often come with simple keyboard controlleable interfaces. 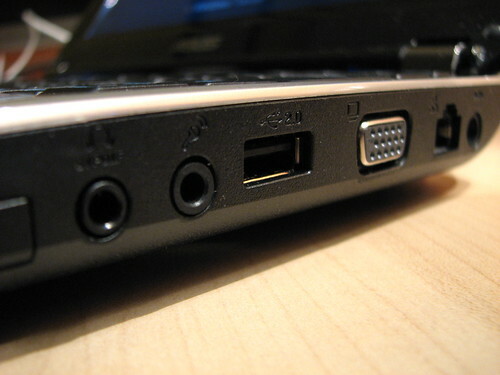 Along the right side, you’ll find the power connector, Ethernet, VGA, USB 2.0, audio in and out connections and Express Card slot. Glance over to the front and you’ll find a multi-format slot for MMC, MS, MSPRO memory cards. Swing over to the left side, you’ll find the graphics switch, HDMI, two USB 2.0 ports and the Wi-Fi switch. 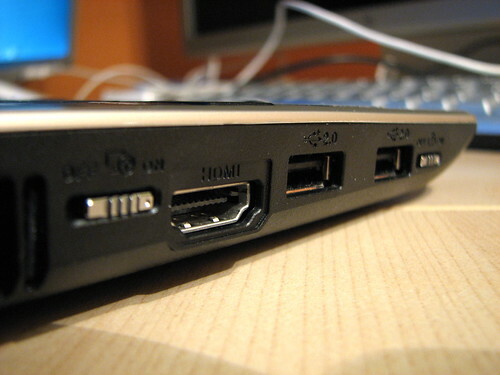 You’ll often find a VGA connector included in Netbooks, however Asus goes one step further and throws in HDMI for connecting up either to your HD TV or LCD display. Powering the graphics of the N10J is not one, but two graphics chips. Incredible considering we’re talking about a Netbook. First introduced to the world by Apple’s latest MacBook notebooks, the Asus N10J follows closely with the inclusion of an Intel GMA950 discreet graphics and an NVIDIA GeForce 9300M GS dedicated graphics with 256MB of RAM. Switching between the two graphics chips is done through the switch on the left side and requires a reboot to activate it. Not the slickest of implementations, but an acceptable compromise. In my video playback tests, the N10J wasn’t able to playback 720p HD video but did playback standard resolution and DVD videos perfectly well even on the Intel chip. It’s a slight disappointment when you consider that it’s got a 1.6GHz Atom N270 processor and 2GB of RAM but when you remind yourself that this is a Netbook, things do make sense. However, that leaves me to wonder why you would need a dedicated graphics chip in the first place if not to boost video playback, then what? Play Crysis? With only 256MB of RAM from the 9300M GS, you can’t expect to get much more than a nauseating slideshow, when playing current generation 3D games. The only reason I can think of, for why a dedicated graphics solution has been included in the N10J is for when you plug a large external display with HD or higher resolutions. Battery life tests proved that the N10J can last up to four hours when using it to browse the web and for general tasks such as IM and e-mail. Put a video on and battery life still comes in at a respectable three and a half hours. 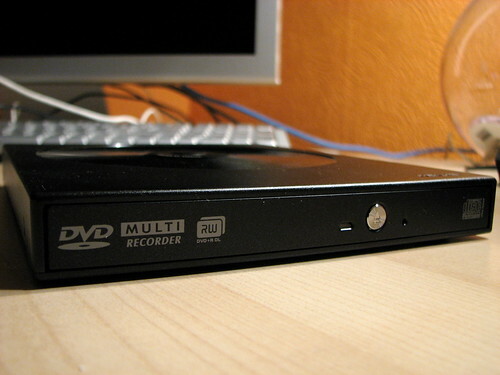 Shipping with the N10J, Asus have generously included an external DVD RW optical drive that powers from two USB ports. This is a first for a Netbook which do not normally ship with optical drives integrated or external. You’ll also find a two year warranty card for parts and labour from Asus. Windows Vista ships on the N10J as standard, however I was more interested in seeing how the latest build of Windows 7 would fare. On first install, all drivers apart from the fingerprint reader and NVIDIA graphics card were successfully detected and drivers installed. Performance was snappy thanks to 7’s reduced memory footprint which meant for fast boot up times and a responsive experience. The spec sheet for the N10J is a very attractive proposition for anyone whose currently looking to spend some money on a Netbook. With the added extras such as the optical drive and two year warranty, it’s a very competitive buy, which may just prove to be a winning formula for Asus as other PC manufacturers jump on the Netbook bandwagon. Quite an attractive offering but pricey for a Netbook when there’s talks of new ones for 2009 for less than £100. I think 2009 will be about mini laptops at a range of prices rather than just the low-end market. Take Sony’s recent unveiling as an example. I think there’s a place for that and this Asus in the market. Obviously it runs Windows 7, does it run Vista? hahaa. I installed Windows7 but the fn keys does not work. When I press fn keys it does not display the 3D icons(?) on the middle of the screen. @Brian: Have you installed the drivers that are supplied with the Asus notebook? Windows 7 won’t come with the necessary software to get the same functionality running as you did when it came preshipped with Vista. Give the install CD a go and see if that works. The Fn keys won’t work without it since it’s a manufacturer-specific feature of the notebook. I installed Windows 7, with similar results. Can’t find updated drivers for the fingerprint reader or the NVidia card. Also, the Intel GMA 950 doesn’t work when I attach an external monitor via VGA cable: The system immediately blue-screens. Has anyone found video drivers that will allow the use of an external monitor in Windows 7 for this? Otherwise, I’m quite pleased both with the N10J and with Windows 7. Yes, the N10J will run Vista thanks to its 2GB of RAM, but it’s not fast. Windows 7 is a much better OS for the Atom 1.6GHz processor. Surprising, my Asus N10J wasn’t supplied with an external optical drive. My supplier (Misco) denied that the optical drive was an included accessory !